Neptune and Asbury Park officials update the funding chart for the Wesley Lake Rehabilitation Project on March 19. 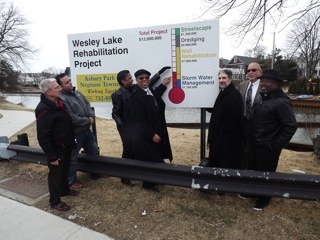 From left to right: Wesley Lake Commissioner James Henry, Asbury Park City Engineer Joseph Cunha, Wesley Lake Commissioner Sharon Davis, Neptune Mayor Michael Brantley, Project Engineer Peter Avakian, Neptune Business Administrator Vito Gadaleta and Wesley Lake Commissioner Pastor Paul Brown. The first phase of a proposed $12 million restoration project to Wesley Lake is underway and more funding is being sought to complete the project. “This is just the beginning and we have a lot more planned,” said Neptune Mayor Michael Brantley, who also chairs the Wesley Lake Commission. The Wesley Lake Commission held a press conference and groundbreaking ceremony on March 19 to celebrate the beginning of the project. “We are aggressively seeking more money,” Brantley said. Under the current $1.4 million project, both Wesley Lake, between Asbury Park and Ocean Grove, and Fletcher Lake, between Ocean Grove and Bradley Beach, will be dredged. About $400,000 of the funding will be used to remove silt in the eastern portion of Wesley Lake and $300,000 for de-silting Fletcher Lake. The rest of the current funding will be used to repair a Wesley Lake retaining wall. About 400 linear feet of retaining wall along the southern side of Wesley Lake will be replaced after being damaged during Superstorm Sandy and an estimated 45,000 cubic yards of silt will be removed. Brantley said it is expected the project will be completed by Memorial Day weekend. Future funding will fund storm water management projects, restock lake with fish, and restore walls, pedestrian areas and streetscapes around the lake. Neptune Township Engineer Peter Avakian said that funding for such projects is always an issue. “We always had a vision for the lake but no funding,” he said. Neptune Business Administrator Vito Gadaleta said restoring Wesley Lake is important to both the township and Asbury Park. “It’s important to see the rebirth of this lake and it’s an important asset to both communities,” he said. A major $1.3 million grant for the current project came from National Resource Conservation Service [NRCS], a federal agency administered by U.S. Department of Agriculture. The state Department of Environmental Protection and the State Historic Preservation Office have oversight on the projects because Ocean Grove is an historic district. Neptune will pay 10 percent of the cost, or about $146,200 with money coming from the Monmouth County Open Space Grant Program and the township’s capital improvement fund. Neither Asbury Park nor Bradley Beach has committed any money toward the two dredging projects. Posted in Asbury Park City Desk, Shore Communities and tagged Asbury Park, Neptune, Ocean Grove.